In the 1940's Japanese knifemakers combined the virtues of European and Japanese knives to produce the santoku - a design classic that has now become ubiquitous in kitchens throughout the world. 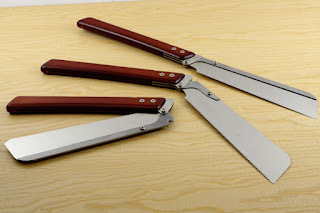 Gyokucho, the company that invented and perfected the replaceable blade Japanese saw in the 1970's, are fishing for a little bit of that same east-meets-west magic with their new range of Fugaku folding saws, and I believe they have hit upon something rather special. 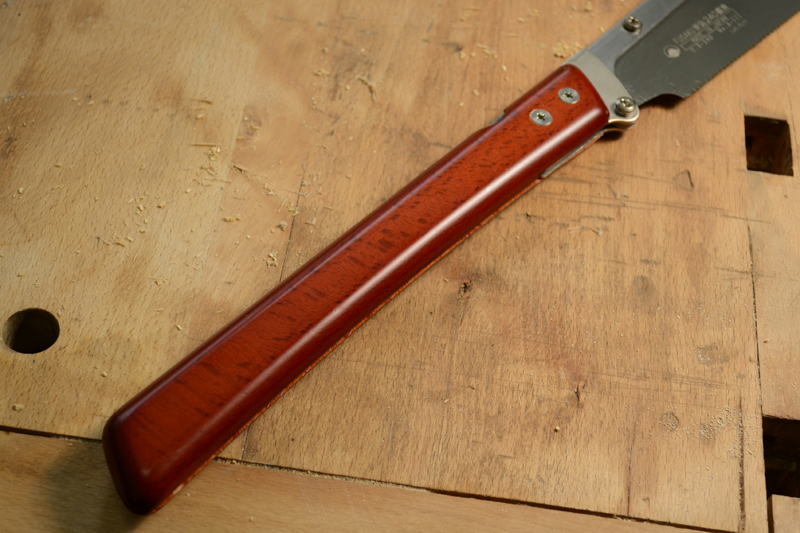 Lacquered quartersawn beech has been the preferred handle material for English backsaws for centuries. The way that the material is cut from the log maximises its dimensional stability and, when the light catches it just right, also displays the flower of the timber beautifully in the faces of the finished piece. This harmonious combination of function and appearance is just the sort of thing that the Japanese appreciate and it sits naturally with their own experience of high quality lacquered finishes. 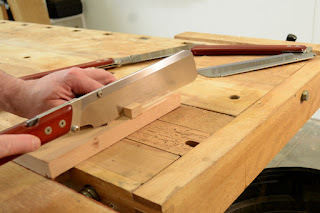 Another functional aspect of western backsaws is the clever use of weight, a carefully proportioned spine engages the teeth perfectly for maximum cutting efficiency and the sawyer can use their discretion as to how much of the saws weight they either support or allow the wood to bear. It's a bit like driving a car with cruise control stuck at 55 and controlling everything with the brakes. Master this and you can start smoothly and stop at a line. Rather than adding weight simply for its own sake, Gyokucho have used it to over-engineer a beautifully smooth folding mechanism and a folded spine made from a thicker steel pressing than that used on their traditional Japanese saws. This extra weight gives the saws a more pronounced sense of feeding the power on or holding it back, as well as the technique common to both cultures of using sharper strokes to cut faster, or softer ones to cut with more control. The blade geometry and toothing are all Japanese; for saws that are used horizontally the logical arguments for a pull stroke and a thin blade working in tension are unassailable. 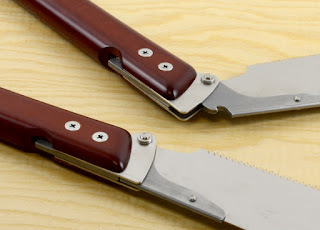 They have however, chosen blade designs from the existing Gyokucho range that are functionally closest to the western trinity of dovetail saw, carcase saw and panel saw. At the moment woodworkers are polarised by lack of choice into a preference for either western or Japanese saws. Whether there is also a group who prefer saws that respectfully draw upon both traditions, only time will tell.